Figurative sculptures representing different social, racial and cultural backgrounds, ages and scales occupied the same space and time in Equivalents. 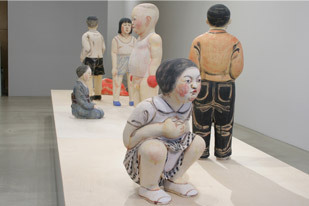 Exhibited at the Kunstforum Solothurn Gallery, the figures engaged in their own world, unaware or perhaps indifferent to their neighbors’ activities. A sturdy toddler in black shoes and red mitten stands next to a smaller-scaled woman kneeling in a traditional kimono. A young woman squats with focused concentration with five sleeping figures nearby. They are not cultural ideals, but rather, the curious varieties of everyday people who are equivalent as human beings.